It’s officially the peak of the holiday shopping season, and there’s nothing we love more than giving the gift of Tetris! To make the gift-giving process as seamless as possible, you’ll want to create a list of ideas and/or specific purchase requests. If the list is a little on the short side, or if you simply want to add a surprise gift to the mix, sifting through ideas and suggestions can help jog your creativity. Whether you’re looking for something brand new like Tetris Effect, or something with a vintage Tetris feel, we’ve got a list of Tetris gift ideas that are perfect for all of your holiday shopping needs! Tetris Effect is the latest release in the Tetris franchise that seamlessly blends a kaleidoscope of unique visual backgrounds with a moving soundtrack to create a one-of-a-kind Tetris experience. The game is available now on the PlayStation 4 and includes full PSVR support, helping bring players closer to the game than ever before. Featured on many “Best of 2018” lists from outlets like The New Yorker and The Washington Post, Tetris Effect is a must-have for any Tetris fan. Best of all, you can pick up a copy at most participating retailers both online and in-store! For a slightly different take on Tetris, we recommend giving Puyo Puyo Tetris a try. Not only is Puyo Puyo Tetris a hit within the Tetris franchise, it also boasts cute and colorful animation, memorable characters, and an intense, competitive multiplayer scene. There are a variety of game modes for both Tetris and Puyo Puyo, as well as a campaign that’ll help teach you the ropes of both. Overall, Puyo Puyo Tetris is bright, fun, and perfect for the whole family. Best of all, you can grab a copy of Puyo Puyo Tetris for Nintendo Switch, PlayStation 4, or PC via Steam! Have you ever wanted to keep a copy of Tetris in your pocket? Need a stocking stuffer that’ll actually fit inside your stocking? 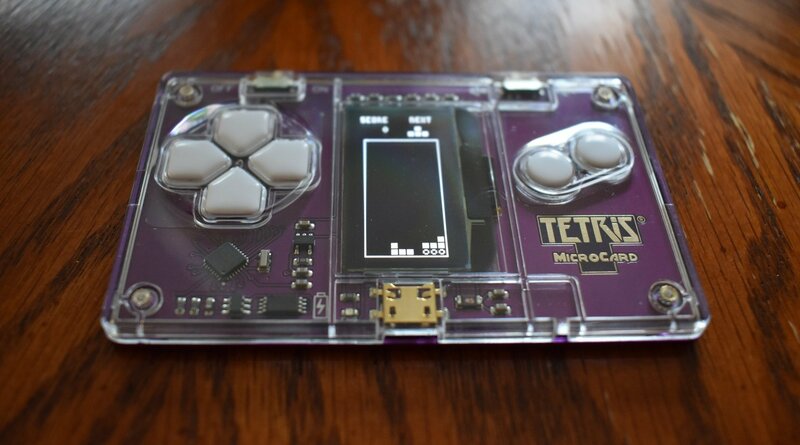 We have good news, as the Tetris MicroCard is available in our Tetris Shop for a limited time! While you can certainly play Tetris on your phone through games like Tetris Blitz, the MicroCard offers a cool tactile experience thanks to its small, functional buttons. It also has a bright LED display, six full hours of battery life, and the Tetris Theme music. When shopping for a Tetris fan that seems to have everything, you really can’t go wrong with the MicroCard. Again, it’s only available for a limited time, so be sure to buy your Tetris MicroCard before it’s sold out! Looking for a little nostalgia? Look no further than the Tetris Handheld Mini from Basic Fun! What’s nice about the Tetris Handheld Mini is that it offers a retro arcade experience, no quarters required. 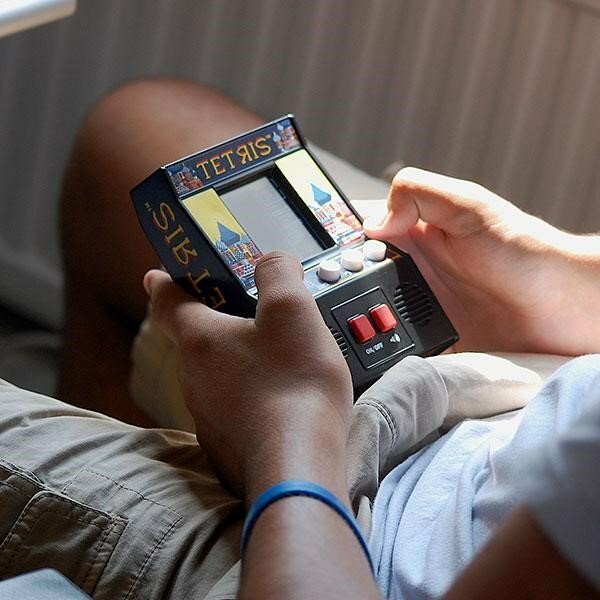 Whether you’re shopping for yourself, or someone else, the Tetris Handheld Mini is the perfect addition to any Tetris collection. Plus, it looks absolutely adorable on any gaming shelf. If you’re sold on the idea and want to grab one, you can purchase the Tetris Handheld Mini straight from the Tetris Shop! Speaking of retro, the Legends Flashback console from AtGames boasts a huge roster of legendary titles, including Tetris. 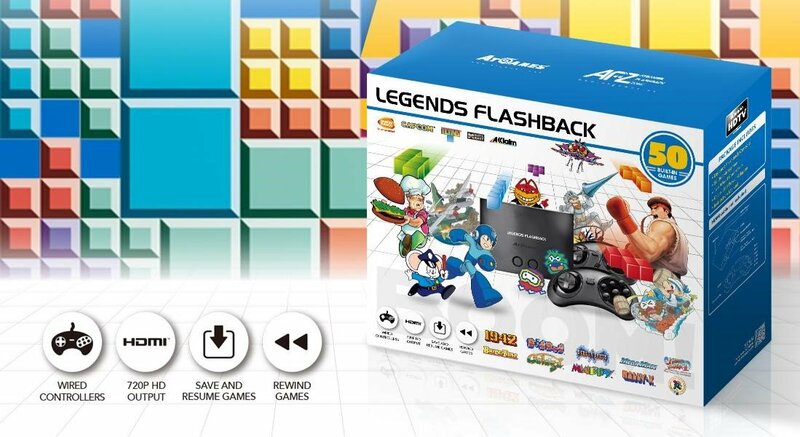 There are 50 games included in the Legends Flashback, all contained on an adorable system with two wired controllers, a 720p HDMI output, and an SD Card slot. With mini consoles being all the rage nowadays, you really can’t go wrong with the Legends Flashback as it’s one of the only retro systems to offer Tetris. To get your very own Legends Flashback, head over to the Tetris Shop! In addition to the Legends Flashback, there’s another system that includes Tetris. Want to mix handheld portability with a retro gaming collection? Check out the Go Retro Portable from Retro-Bit! The Go Retro Portable includes a mix of 260 games, Tetris included. You can get up to 10 consecutive hours of gameplay out of the Go Retro Portable, making it a fantastic gift for someone who travels a lot. Need to get one? 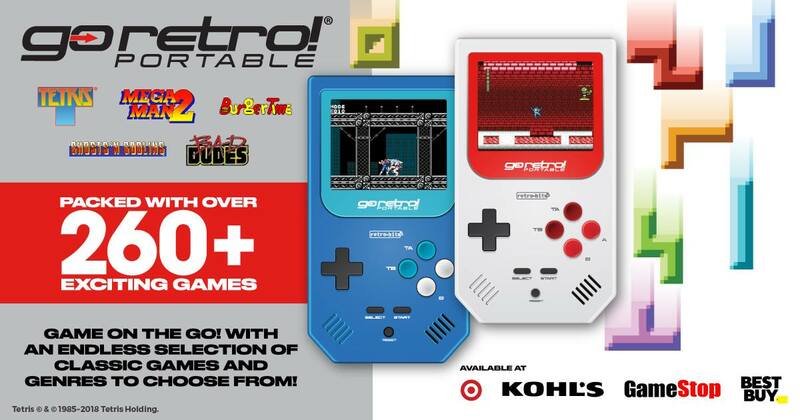 You can find the Go Retro Portable at a variety of retailers including Best Buy, GameStop, and Target. Last, but certainly not least, we have the perfect addition to any wardrobe in the form of the Dibs x Tetris t-shirt! Like the Tetris MicroCard, the Dibs x Tetris t-shirt is available in limited supplies, meaning you’ll want to act fast if you plan on purchasing one for you or your loved one. 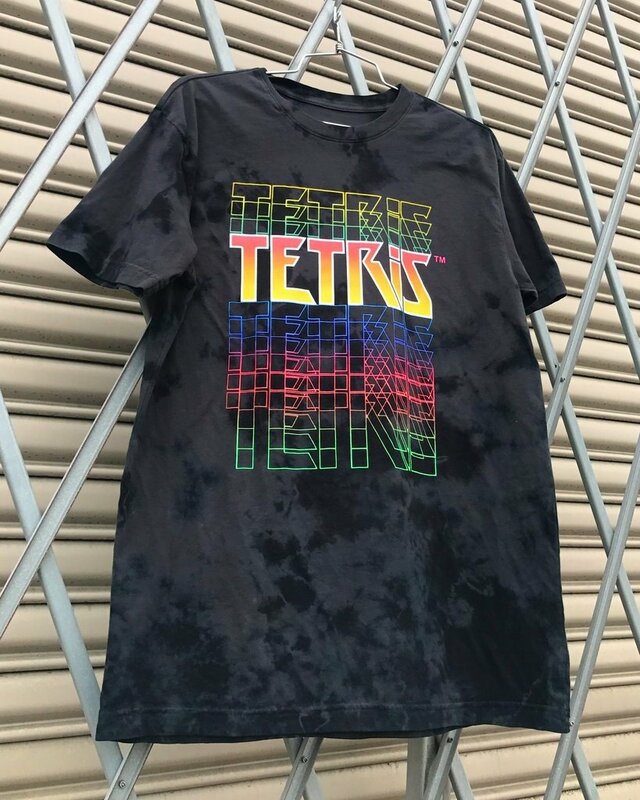 Alternatively, if the Dibs x Tetris t-shirt isn’t your style we have a huge collection of apparel for sale in our Tetris Shop. You can get something for your friends, family, and even yourself! Whether you plan on buying one Tetris gift, or a couple, there’s no shortage of cool ideas to choose from to help satisfy everyone on your holiday shopping list. Need to take a breather? Click here to play a few rounds of Tetris right here on our website!